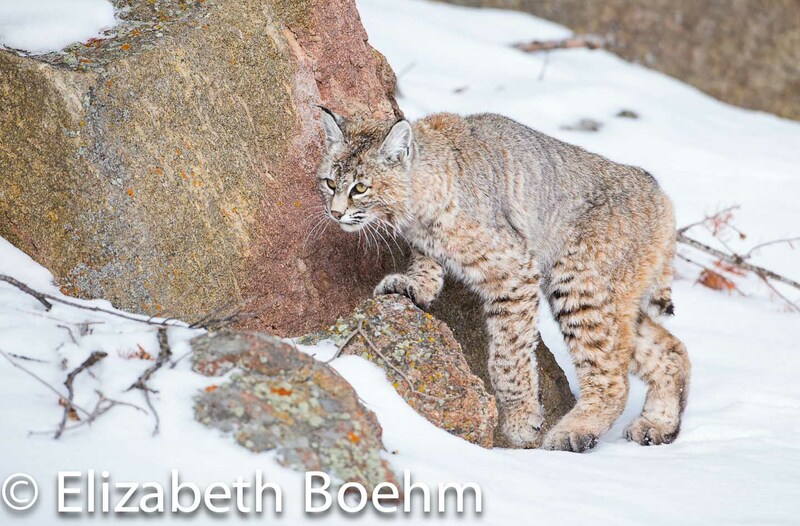 The bobcat (Lynx rufus) is an elusive feline that is often seen tail-end going into the bushes. I feel fortunate to have seen a number of these medium-sized cats not to mention having had several great photo ops! 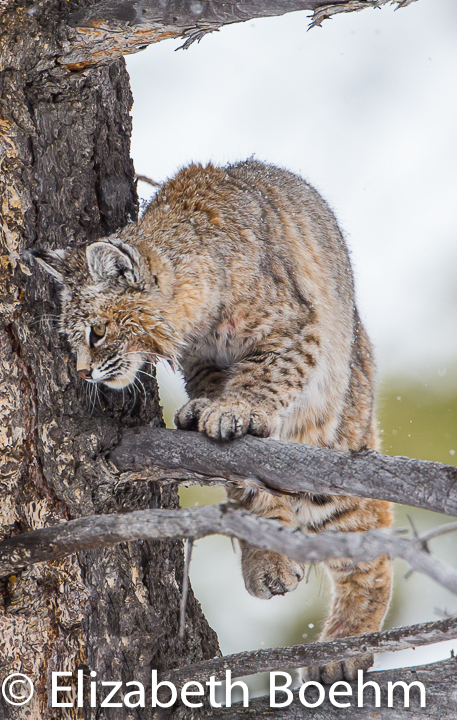 These cats love the scrubby brush and trees along the river bottoms here in Wyoming. I often see tracks in the fresh snow throughout the winter and always hope to catch a glimpse. They are very stealthy and will eat a number of critters including small mammals, ducks, and carrion. They have even been known to take down much larger animals such as deer. 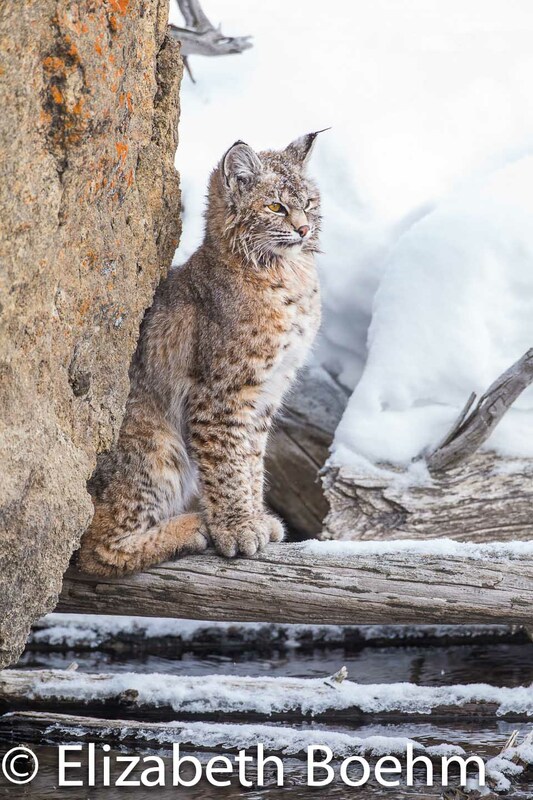 Recently in Yellowstone National Park, a bobcat has been seen and photographed frequently as it stalks and hunts the waterfowl along the Madison River. We watched this awesome cat stalk it’s prey and try to blend in and hide, using the logs along the shoreline. Like my indoor cats they are incredible athletes and very good at what they do; stalking, hiding, and catching prey! The females have territories of approximately five square miles with no overlap within the same gender. Males will have much larger territories and may have several females within their range. The kittens will follow their mother around for almost a year before she sends them on their way. On an autumn afternoon, I watched a family group slowly saunter away from me into the sagebrush; the two little ones stuck their short tails in the air and swaggered into the brushy ditch reminding me of my house cat as it rules our household. Watching these wild felines is truly awesome and having one in your viewfinder is definitely “a photographer’s high”. As always nature never seizes to amaze me. This time it was a tree-climbing coyote! The event took place in Yellowstone National Park along the Madison River. 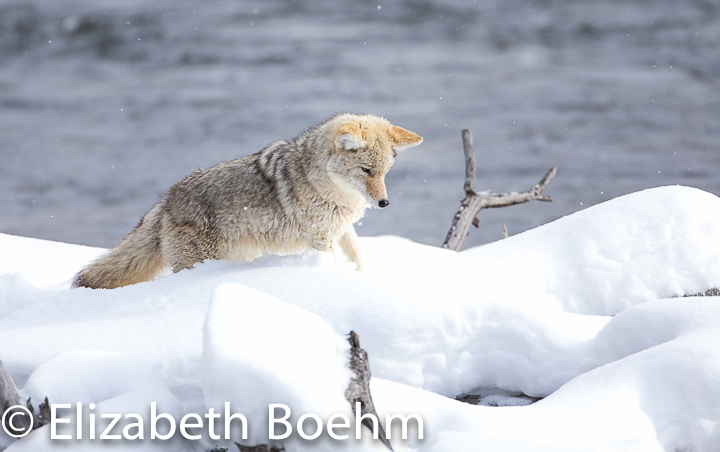 My friends and I were along the main road attempting to photograph a coyote which was obviously searching for something?. Suddenly it heads into the trees and stands directly under a small lodgepole pine looking upward. He stands up on his hind legs and proceeds to methodically climb up the branches as though he was an agility dog climbing a ladder. 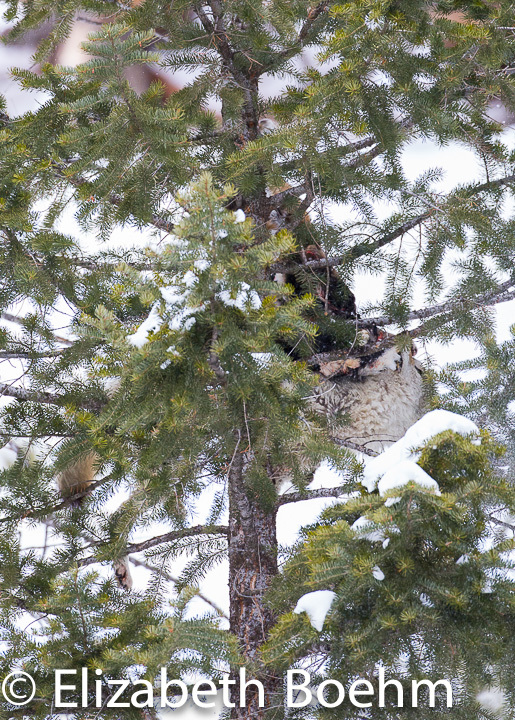 As we stood with open mouths, our guide shouts “He is after the bobcat in the top of the tree.” Sure enough behind the branches at the top of the tree sits the bobcat we had been diligently searching for and it was holding a partially eaten Common Merganser in its jaws. We continued to watch and photograph as the coyote climbs higher up the tree until he can reach the duck. In a quick sudden move he grabs the merganser and pulls the bobcat, duck, and himself to the ground. He proceeds to steal the duck and consume it as the bobcat, obviously quite upset, walks away and climbs a much bigger tree (with no lower branches) to sulk and work his self-cleaning tactics. All of this happened quite quickly with barely time to set up, focus, and snap a number of photos. 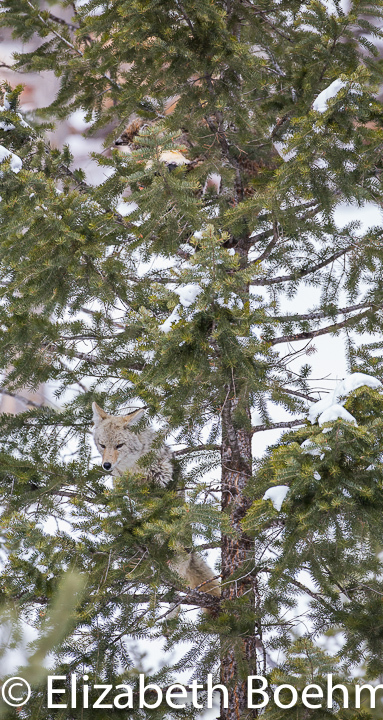 I am very aware that coyotes can be quite the opportunists, but had I not seen it with my own eyes, I may not have believed this canine would climb a tree for it’s dinner!